From the data and papers linked to on these earlier posts I have drawn on a few basic premises on which the new forecasts rely. 2.The best way of distinguishing the main climate trends and drivers is by power spectrum and wavelet analysis of any time series which might be pertinent and correlation of these power spectra to distinguish forcings and feed backs. 3.A small number of time series are useful proxies for and can usefully and economically represent the trends in and the drivers of a large proportion of the past global climate variabilty and point the way to the likely future.It is not necessary to know the precise mechanisms and time series interactions which produce these time series observations in order to use them for successful prediction. 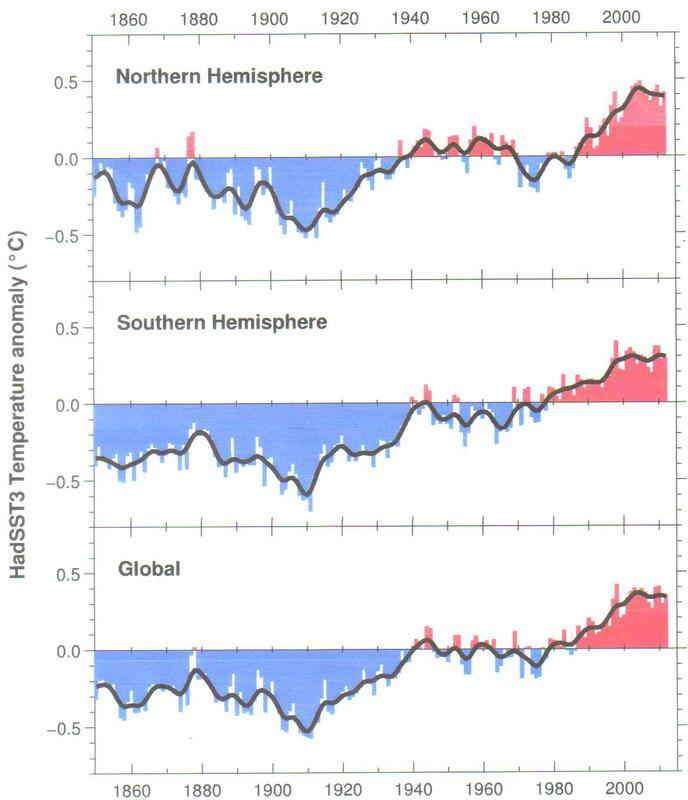 4.The present analysis which looks ahead to 2035 and 2100 is based on a few simple ideas and empirical observations..
e)The temperature trends in the first +/- 100 years after the peak are likely to be the reverse of the trends in the +/- 100 years before the peak and the Hadsst3 data set Figs 2 and 3 is a generally accepted representation of the latter trend. f)The main climate driver is the sun . Incoming solar radiation is modulated by the Milankovitch orbital cycles and by variations in solar "activity" manifested by changes in GCR flux at the earth,by changes in EUV radiation, changes in the frequency and energy of CMEs and Proton events ,changes in solar wind speed and changes in TSI.Incredibly ,only the small TSI change is considered in the IPCC models-.The change in albedo caused by the GCR- cloud iris effect and the change in atmospheric chemistry caused by UV variations are probably more important than TSI itself. g)A lunar influence is also evident in the temperature power spectrum. h )The Neutron count can act as a useful proxy for solar "activity" particularly as the instrumental data can be projected back via the 10Be flux for millions of years.. 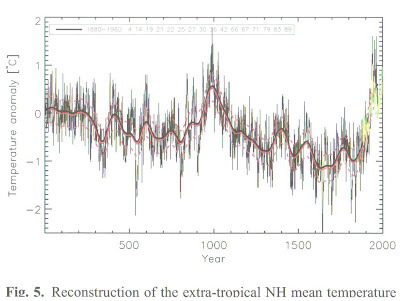 Here I make the same assumption that the current temperature peak is an approximate repeat of the +/- 1000 AD solar cycle related temperature peak (Fig1 ) .The simplest assumption for trends following the peak is that the downslope to about 2650 AD may well look like the downslope from 1000 to1650.Naturally predictions beyond the 30 years which coincides with a PDO declining temperature trend would be increasingly more speculative. Using the HADSST 3 data as a go-by (figs 2 and 3) produces the following estimates . The rising trend peaks out at 2003-5 Fig2..A rise occurred from 1975 - 2003-5. We might therefore look for a similar cooling from 2005 to 2035 The average peak temperature has an Hadsst 3 anomaly of about +0.38 . The rise from 1975 was from about -0.15 to +0.38 = +0.53 . 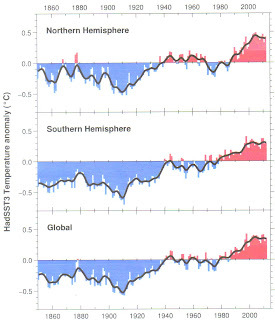 and thus we might look for a similar decline in global SSTs temperatures to - 0.15 by 2035. This would coincide well with the current 30 year cooling phase of the PDO. More speculatively we might similarly estimate a recovery to + 0.1 by about 2060 followed by further Global cooling to - 0.5 by 2100 - equivalent to the 1910 temperature. Of course these numbers relate to the general trend- during the downtrend we would expect higher frequency variabilty in temperature highs and lows to the same extent as seen in Fig 2. but both would generally decline until 2035. There was a secular change in the related Ap index in 2004-5 which could presage a sharp temperature drop in about 2016-17 and the Oulu data show an increase in the neutron count also in 2004- 5 which might indicate the same thing and which is alredy built in to the system. It is possible that the record 20th century peak in the 2009 count might indicate a real cold snap in 2021-22.
cooling and help maintain crop yields . cooling than that forecast above which may turn out to be a best case scenario.